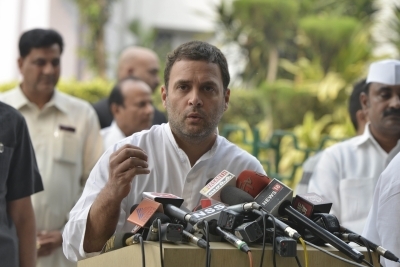 New Delhi, Oct 30 (IANS) Congress Vice President Rahul Gandhi on Monday again criticised the government’s reform measures of demonetisation and GST, terming them a “double whammy” that hit ordinary people hard, crippled businesses and caused large-scale job losses. “In the GST meeting, it was discussed how a good idea was destroyed. GST is a good idea but the government has implemented it in a faulty manner due to which the economic growth of the country was badly hit,” he said. He said that Prime Minister Narendra Modi gave two shocks to the country “one after another”. The demonetisation of Rs 500 and Rs 1,000 notes was the first torpedo from which the country survived, but the second torpedo of GST destroyed it, he added. He also said that Modi is celebrating November 8 as anti-black money day without understanding how much loss demonetisation has caused to the economy. “He (PM) should have feelings for the country. He should understand, but unfortunately he is not able to understand the pain and suffering of the people,” said Gandhi. Congress spokesperson Randeep Singh Surjewala, briefing reporters on what Gandhi said at the meeting on demonetisation and GST, said: “Both demonetisation and GST were sold to the people by BJP and the Prime Minister as a panacea for providing relief to the poor, ordinary people and small businesses besides fighting black money. “He (Gandhi) pointed out that both demonetisation and GST had turned out to be double whammy in the life of ordinary people and has crippled, shut down businesses, trades besides leading to large-scale job losses,” Surjewala quoted Gandhi as saying at the meeting which was also attended by former Prime Minister Manmohan Singh. Gandhi’s remarks come a day after Prime Minister Modi said he was prepared to pay any price but would not roll back the reforms.